Ottawa, Canada, June 24, 2013 – The Hotel Communication Network, Inc. (the “Company” or “HCN”) today announced that it has successfully concluded field trials of its “Free-to-Hotel” communications infrastructure program in key flagship hotel properties in Chicago, the Chicago Hilton & Towers, The Chicago InterContinental and the Millennium Knickerbocker. Under the program, HCN effectively eliminates the cost of equipment and infrastructure to hotelier customers through developing alternative revenue streams from various stakeholders. Kevin Bidner, President of HCN, said that “The success of this installation is a landmark breakthrough for the industry, paving the way for a national rollout under a business model that removes the cost barrier to providing a better guest experience. In addition, it provides our hotel clients with a more effective hotel , meeting and convention communications solution that enables them to enjoy the benefits of the technology without having to bear the costs”. Value to Local Business – more effective promotion of services to guests. HCN has installed close to 3,000 units in Chicago, with an additional 2,000 rooms to be installed this fall, and is in the process of selecting its second city for installation of another 6,000 to 8,000 rooms. About The Hotel Communication Network, Inc. The Hotel Communication Network, Inc. (HCN) is a leading provider of guestroom computers to hotel properties. 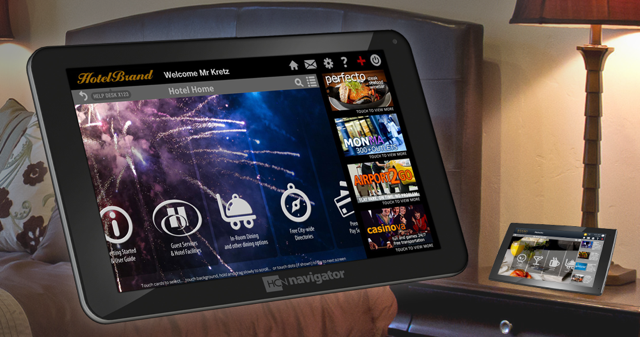 HCN’s Navigator in-room computers and tablets provide guests and convention attendees a “smart screen” to access hotel services, local dining and tourism venues and meeting information. Under HCN’s unique business model, the deployment and maintenance of the Navigator computers are heavily subsidized by revenue from various sources including the guest, local tourism related businesses and meetings and conventions that utilize HCN’s in-room computer network to provide useful, timely information to attendees. For more information about Hotel Communications Network, please visit www.hcn-inc.com.